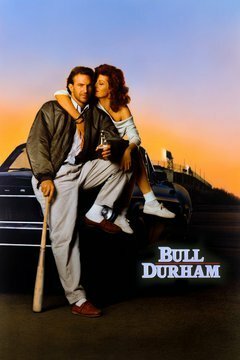 In Durham, N.C., the Bulls minor league baseball team has one asset no other can claim: a poetry-loving groupie named Annie Savoy (Susan Sarandon). As the team's season begins, Annie selects brash new recruit Ebby Calvin Laloosh (Tim Robbins), whom she christens "Nuke," to inspire with the religion of baseball. Nuke also receives guidance from veteran player Crash Davis (Kevin Costner), who settles Nuke's erratic pitching and teaches him to follow the catcher's lead.